When dinner parties get awkward, I always pull out one of my favorite ice breakers. I make everyone go around the table and say what song that they would sing if they tried out for American Idol. You see, Whitney and I were friends. She always loved me. She would remind me that I would dance with somebody during middle school slow dances. She taught me how to be an every woman and Queen of the Night at dance classes. 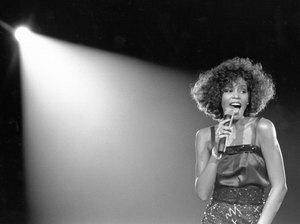 I was so sad to hear of Whitney Houston’s passing tonight in a Heartbreak Hotel room. She was beautiful. Her voice was amazing and she was one of the first superstar singers that I remember in my life. I will always love you Whitney.